Chiasmus is a rhetorical device used most commonly in literature in which two or more clauses are balanced against each other by the reversal of their structures in order to produce an artistic effect. After all, emotional aesthetic resonances are the main aim of these literary tools. 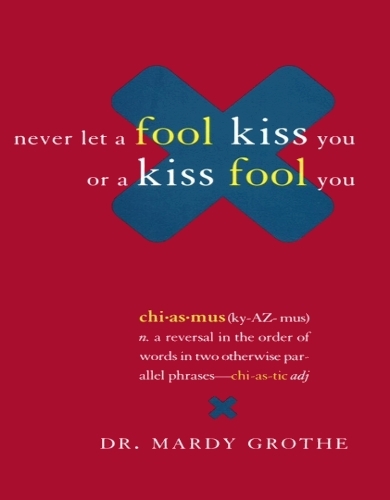 A popular example of a chiasmus is the popular almost-cliched saying “Never let a fool kiss you or a kiss fool you.” If you try to look at that sentence closely, you will notice that the second half of it is just an inverted form of the first half, both grammatically and logically. This shows us that chiasmus, in its simplest sense, refers to crisscross structures, and as weird as that concept may sound, it’s actually pretty common these days. Chiasmus comes from the Greek term meaning “diagonal arrangement.” It is used to describe two successive clauses or sentences where the keywords or phrases are repeated in both clauses, but in reverse order. 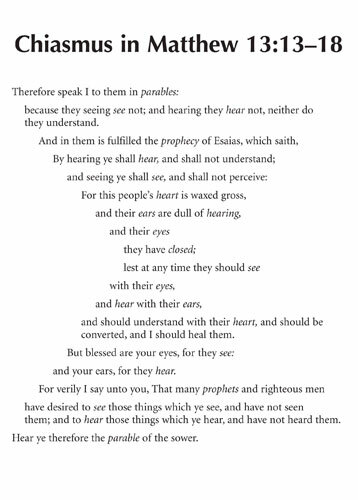 Because of this system, chiasmus is sometimes known as a crisis-figure of speech. Another popular example of chiasmus is the phrase “When the going gets tough, the tough gets going!” The words going and tough are reversed in successive clauses, while the other words (when, the, and gets) bind them together and often include straightforward repetition (the, get/gets). The general pattern will tell us when your first clause contains two words A and B, then the second clause will contain the same words but in reverse order. Symmetry is key to chiasmus. However, the repeated phrases don’t necessarily need to be symmetrical. Which means that a latter phrase might be a much longer elaboration of the preceding phrase which it echoes. 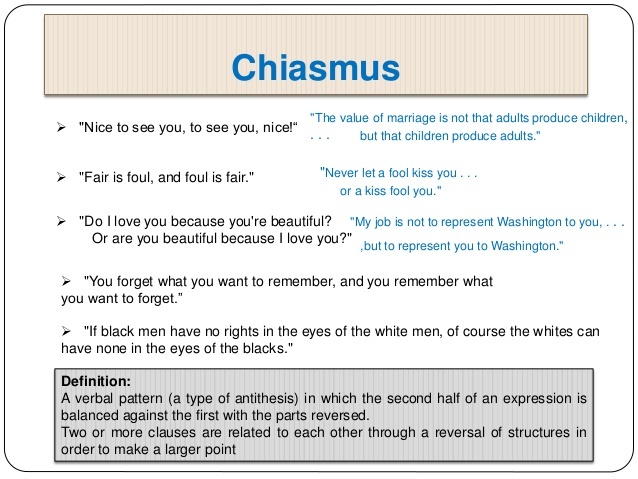 The use of chiasmus as a rhetorical device date back to the ancient Greek and Roman civilizations. Its traces have been found in the ancient texts of Sanskrit and also in ancient Chinese writing. However, the Greeks, unsurprisingly, have developed an unmatched inclination to this specific literary device. They’ve made it a point to make it an essential part of their oration. Here are a few exemplary examples. Why Do Writers Use Chiasmus? That’s the big question, isn’t it? It’s the mystery we all want the answers to, so bad that we’ve arrived at this article in our attempt to know the answer. First of all, you must understand that writers don’t simply use chiasmus—or any other literary device, for that matter—because they feel like it or because they need to add a little flair to their writing. No, they use chiasmus to present and elaborate upon an idea, while persuading and moving an audience and simultaneously lending a harmonious quality to writing through an organized, although not always exact, repetition. That need gave birth to chiasmus. As you can see, the first half of the sentence uses the adjective “cruel,” an abstract concept, one that can be easily misinterpreted or even exaggerated. However, the second half of it elaborates on that assumed cruelty by describing the actions of the children that can make them deserving of the adjective used to describe them. The second half of the sentence gave valuable and concrete detail and imagery. You are no longer dubious of the ability of mere schoolchildren to be cruel, because you have read yourself what they are capable of doing, and upon reading it, the very adjective used popped into your head as the perfect summation of what those kids are. Cruel. This is the aim of writers when they make use of chiasmus. They seek to make their audience understand by telling them what is happening and letting them decide for themselves what to make out of that situation. This has been successfully achieved by the sentence even though if you’ve observed, the halves aren’t of symmetrical length since the second half is much longer than the first. 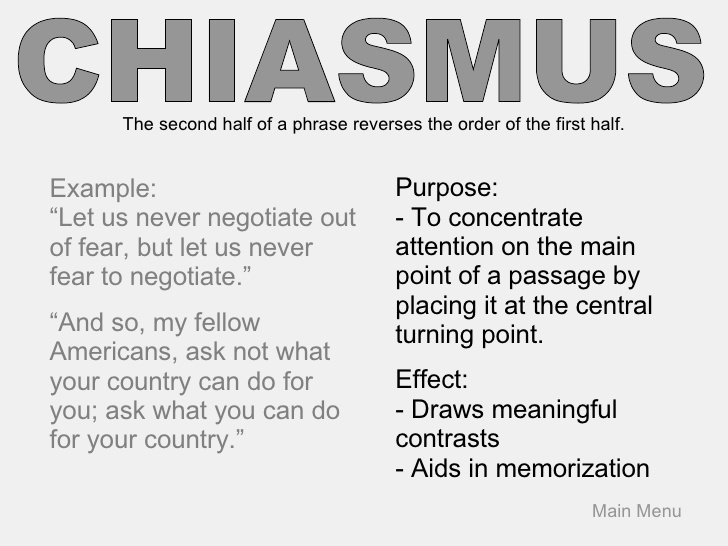 Like all figures of speech based on repetition, chiasmus can also be a tool to craft persuasive rhetoric. It can be used to reiterate concepts, to summarize a complex idea to a manageable size, and to draw connections between contrasting concepts. 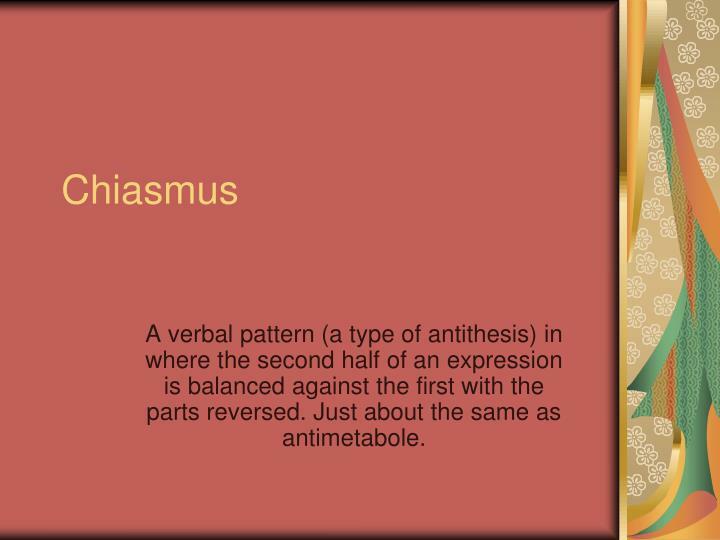 Although it’s not very common, chiasmus appears in many forms, from axioms to antimetabole. (But these two are topics for a different day.) The inverted grammar that chiasmus boasts of can bring a sense of gravity to a sentence. Chiasmus can be pretty difficult to grasp at first, especially since we are so unfamiliar with it. Not its examples, though, since we’ve read Shakespeare and the guy’s great at it, but the technicalities of the concept is foreign to us. 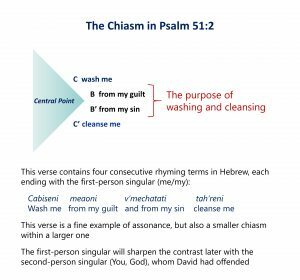 So here’s a closer look at the most important elements of chiasmus. 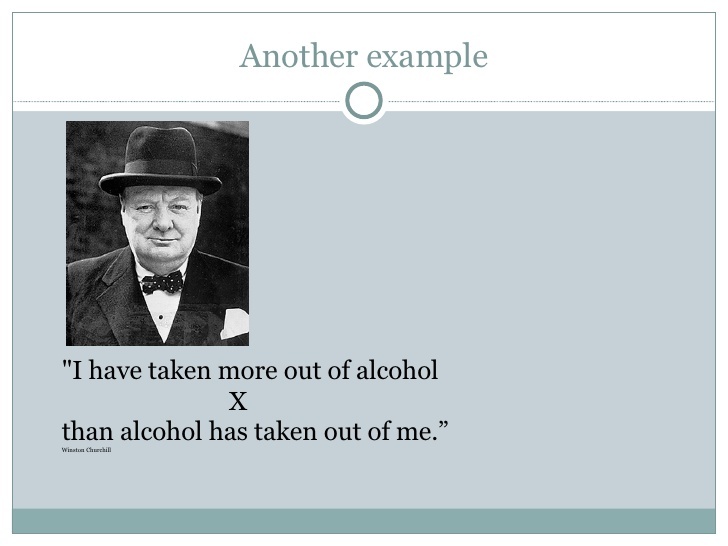 The repeated concepts in chiasmus can be contrasting. 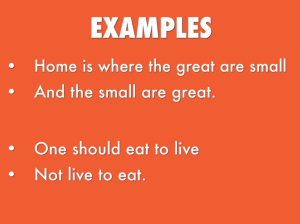 Although many of the examples of chiasmus use synonymous concepts, it can also involve opposite or contrasting concepts. 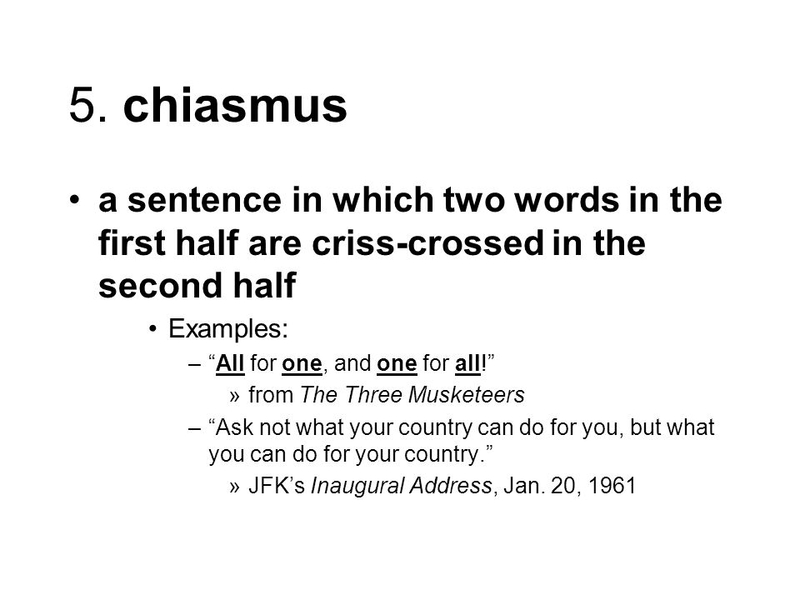 Chiasmus depends on inverted word order. One reason that chiasmus is rare is that it depends on inverting the order of related concepts. 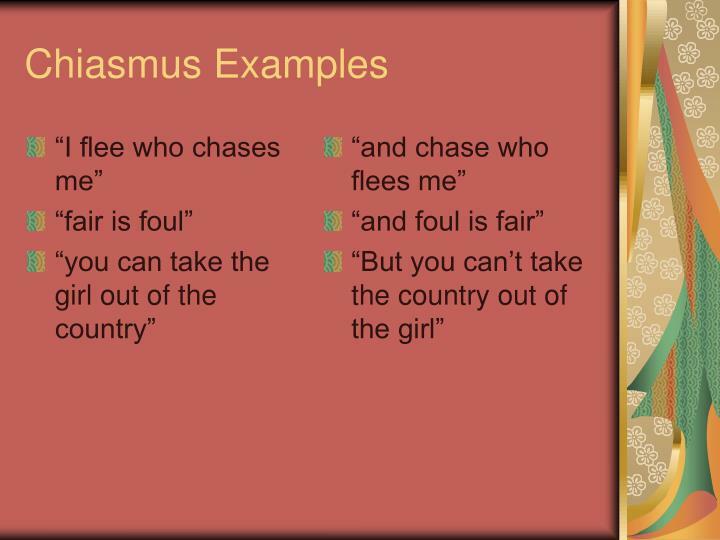 So, although it’s common to come across repeated concepts and syntax in a sentence, these examples may not be chiasmus. If concepts aren’t related, it’s not chiasmus. This is perhaps the most important attribute that we need to look for when we encounter a chiasmus. It’s not chiasmus unless the concepts involved in the statement are somehow related. Of course, this isn’t always easy to determine since there are no rigid rules about what makes two things related, however, keep a sharp eye on the chiasmus’s main attribute. A cup of coffee can never be compared with a lover, even if you can’t live without both since a human being isn’t related to a beverage. Chiasmus is not as popular a figure of speech as your superstars simile and metaphor because it tends to create a language that feels too formal or even stilted. Even so, it does appear on your occasional prose and poetry to produce a lyrical and balanced effect. In fact, Chiasmus was very important in some ancient texts since it is entrusted with the responsibility of striking balance in a work of literature. “Do I love you because you’re beautiful? Use with moderation. 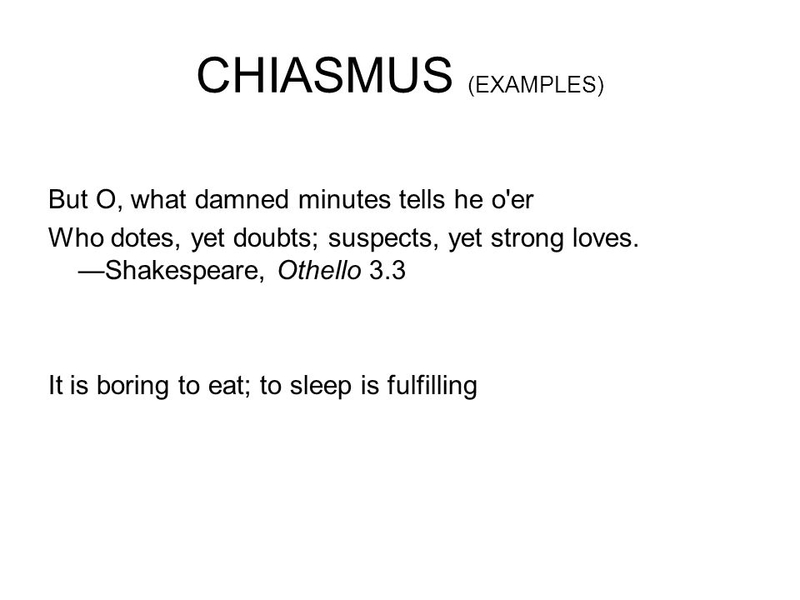 Chiasmus, like all rhetorical devices, is best when used in moderation. You don’t want to create a speech filled with almost-contradicting statements. Instead of making your audience feel something, you may just confuse them with your complexity. If you use chiasmus over and over, you will start diminishing, or worse, losing, the impact. Your speech will sound exactly like an extensive joke instead. One or two chiasmus in every speech is perhaps enough. Rethink relationships. Since chiasmus is a reversion of two personas who has a distinct connection with each other, make sure that the one you make contains this characteristic. For example, you can create a chiasmus on the relationship between children and parents, audience and speaker, reader and writer. But make sure that the personas you use actually have a connection that your audience will easily identify. Question causation. Many chiastic phrases show a causation between entities. This can be a helpful starting point for you if you are still trying out words and mixing relationships to find your own beat. For example, when you say that “I give up when all is lost, but all is lost only when I give up,” you are questioning whether failure causes despair, or despair causes failure. Either way, using a chiasmus to express your wonderment and to seek answers not only makes the statement more poetic, but it also demands its audience to ask the same. Riff off chiasmus examples. 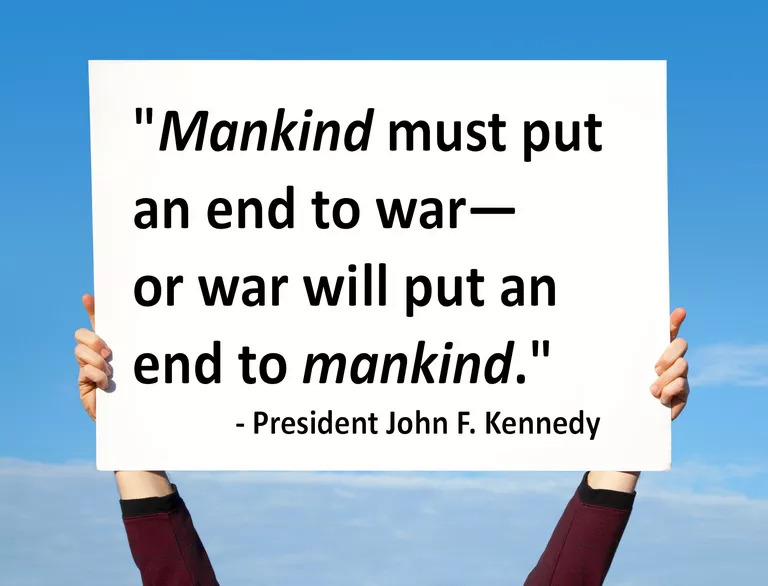 If you’ve never tried to make a chiasmus on your own before, a good place to start is by taking a known chiasmus and using it as a template into which you can substitute one or both key repeated words. No, you are not plagiarizing, you are simply taking out inspiration from the expert words of others. Take the immortal words of Cicero as an example. His original statement says that “One should eat to live, not live to eat.” However, this line has been altered many times. 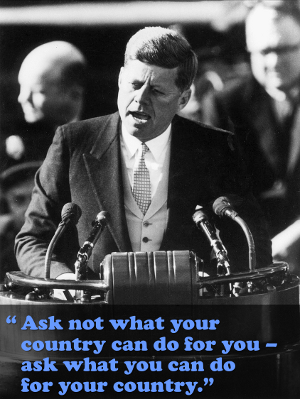 Other people now say that “One should work to live, not live to work.” Can you see the difference? We hope that this article helped you understand one of the most important yet underrated types of figure of speech.